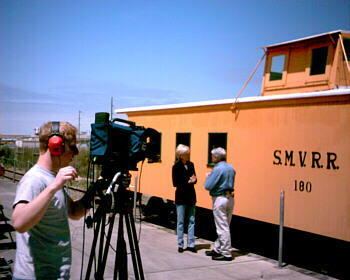 Debby Davidson and her KEYT-TV film crew for "Santa Barbara Treasures" visited the caboose restoration area and the Museum itself today to interview some SMVRHM folks in preparation for a segment on the Santa Maria Valley Railway Historical Museum. Pictured at left, Debby Davidson questions SMVRHM's "Ca-Boss" Phil Goble about the restoration of Caboose No. 180. 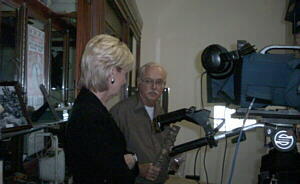 Below, Ms. Davidson discusses the Museum with Wayne Peterson as the camera catches all of the displays. The program is scheduled to air on KEYT-TV on Saturday, May 3rd at 7:00pm.